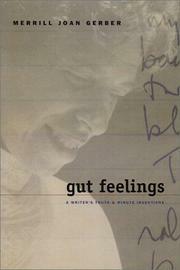 Refined, concise, often emotionally wringing memoir vignettes. These pieces get at the source of fiction-writer Gerber's work (Chattering Man, 1991, etc. ), the kernels and essences and truths that have shaped the imaginings that made her fictions “forms of emotion recollected in an even higher state of emotion.” She knows how to turn a story on a dime, as when Wallace Stegner tells her, “You hold out for what you're worth,” as well as to create a more pervasive atmosphere, as in the stifling pecking order at Yaddo, how she experienced the diminishment of every small disappointment and insult. She can twist the knife of a family who lost three sons during WWII, and she can seesaw between the black humor of “My Mother's Suffering: you could say it was the theme song of my life” to the lacerating words they share when they decide to withdraw her life support: “ ‘But are you sure you're ready to die? Are you ready to say goodbye to us?’ ‘Yes!’ It took all her energy to say the word.” She can, above all, be unsparing, visiting an aged aunt and other old crones in a retirement home, where she “smelled their smell as we all crowded into the small elevator to go down for the watered soup and canned peas for lunch.” Readers can also witness the transmutation of experience into fiction (Gerber includes three stories), feel the blur, as when she relates the suicide of her sister's husband in a piece of pure memoir and then read it again in a story she wrote of the incident, full of friction, dislocation, and the author finding her own measure of veracity. “I wait to receive further news from existence and to give it true justice in the retelling.” She will, too, cutting the facets just right.